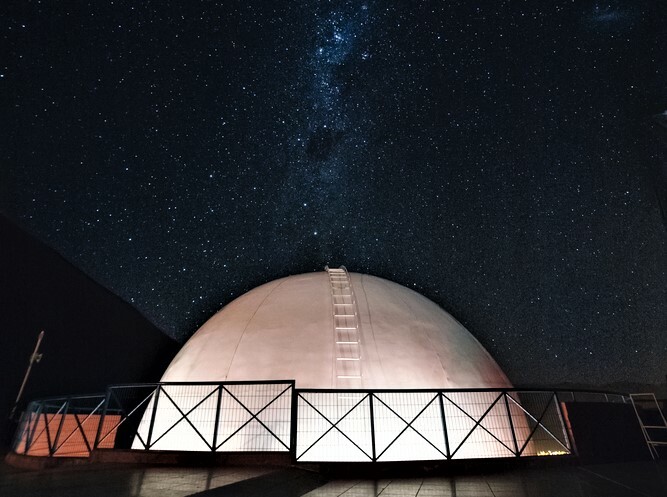 This observatory is a scientific, tourist and educational complex which lies 9 km northeast of the town of Vicuña, 60 km east of La Serena and 565 km from Santiago at an altitude of 1,200 meters above sea level. It is open to the public, and tourists who have a particular interest in astronomy are able to visit the observatory every night of the year, subject only to unforeseen weather conditions. Visitors will need to go to the town of Vicuña (an hour from La Serena by Ruta 41) and register at the Observatory office in Calle Gabriela Mistral 260, Office 1, next to the Bauer Tower and only a few yards away from the main square of Vicuña. There are specialist guides who give explanatory talks about the observatory. The duration of the visit is about 2 hours and the time it takes to get to the observatory from Vicuña is about 20 minutes.